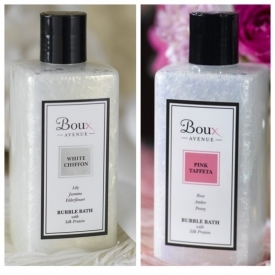 For a shimmery, sparkly bath time our voluptuous bubbles leave you silky smooth with a shimmery sheen. Infused with silk protein, jojoba extract and delicately scented with our Pink Taffeta fragrance, floral and sensuous notes of rose, amber and peony, or if you choose our White Chiffon fragrance, fresh and gentle notes of lily, jasmine and elderflower, all invite you to sink in and relax. This Item is only available from Boux Avenue, there is no other agreed seller. The Boux shops are scented with the memorable fragrance of White Chiffon, so pop along and enjoy a beautiful experience in Lingerie and Beauty. Luxury in a bottle, no matter which fragrance you pick. You will love it. Easy to dispense. Unscrew cap. This is a wonderful new range of Beauty care products from a Brand new company. The bubble bath is luxurious, with a silkiness felt within the water. It's has a two wonderful fragrances that have proven highly popular. The Pink Taffeta is my favourite,with its Rose and Peony scent....White chiffon is alittle stronger with Jasmine and Lily. It's like the ying and yang of perfumes, which is a great concept. The bubble bath doesn't need masses poured into running water, alittle gives exactly the desired treat to your skin. It leaves your skin feeling soft and beautifully scented..
"Luxury in a bottle, no matter which fragrance you pick. You will love it."